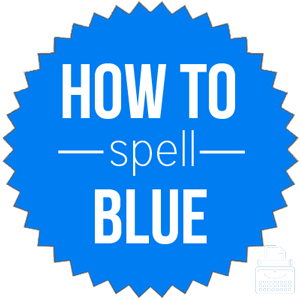 Spelling of Blue: Blue is spelled b-l-u-e. Blue and blew are homophones; they sound the same but are spelled differently and have different definitions. Definition of Blue: Blue is a color that is between green and violet. The sky is blue and so is the ocean. It is also used to describe when someone is feeling down, sad, or depressed. Rarely, blue can be used as a verb meaning to make something blue in color. Pronunciation of Blue: Blue is pronounced bloo. Blue rhymes with clue and flu. What does blue mean? Blue can function as a noun, adjective, or even a verb. As an adjective, it describes either something that is blue in color or someone who is feeling sad or melancholy. He purchased the blue car because it is his favorite color. The clear, blue sky suddenly changed to an eery dark black and purple color. As a noun, the word blue simply refers to the color blue. Then the ship sailed away into the blue. The verb blue means to make or become blue in color. You should not blue your clothes until the second rinse. There are several common phrases and idioms that use the word blue. Black and blue: beaten and bruised, literally or figuratively. Blue around the gills: young and inexperienced. Blue collar: a manual laborer, as distinguished from white collar. Blue in the face: when someone is at the point of extreme frustration or exasperation. Into the blue: to go a far distance or into the unknown. Out of the blue: at a random or unexpected time; from an unexpected source. Feeling blue: when one’s mood is sad and melancholy. Once in a blue moon: rarely; not often. According to Merriam-Webster’s, blue was first used in the 13th century. This Middle English word blue came from the Old French word bleu, which is of Germanic origin and related to the Old English blaewen, meaning blue, and the Old Norse word blar meaning dark blue. When describing the color of something, the following synonyms can be used, but it’s important to choose the correct hue of blue. When one’s mood is sad, depressed, down, or melancholy, the following words can be used to replace blue. Blue functions as a noun, adjective, or verb; it refers to the color, the color of something or someone, one’s mood, and the act of turning or becoming blue. There are many shades of blue.